Removals are our business, and they have been our business since 1996. Moving home can be frantic and fraught, with all the unnexpected details and eventualities. Phone, satellite and energy connections and suppliers, change-of-address notices and post forwarding, and all the hilarious bureaucracy that goes with it - it’s never simple. And then there’s the packing. At least there’s no need to worry about the actual move. We are conscientious, dedicated and very experienced  we’ve been arranging London removals for more than 12 years.. We’ll make your move make it as simple and smooth as possible. We navigate using maps and our driving experience, so we’ve never once called from a field to blame the satnav. We are insured through the Road Haulage Association for up to £10,000. Please tell us about any high value items when you book your home removal. 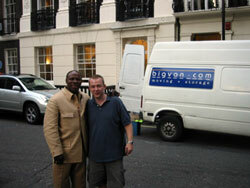 London removals have been our business since 1996.